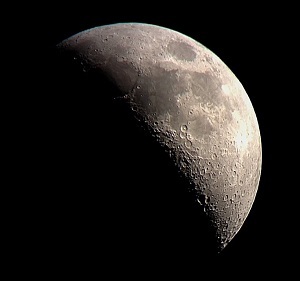 I took these photos on January 3, 2013 at 12:20am (just now getting around to posting). 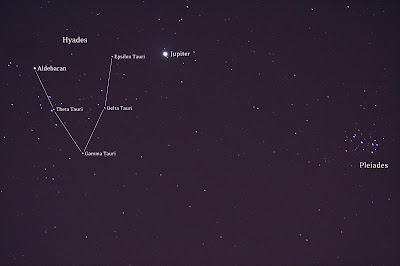 If the beautiful conjunction of Jupiter with two prominent asterisms (Hyades and the Pleiades) weren't enough, I wanted to look up some more information on the Hyades star cluster for my own benefit. I'm also working on improving my manual noise-reduction technique by stacking. 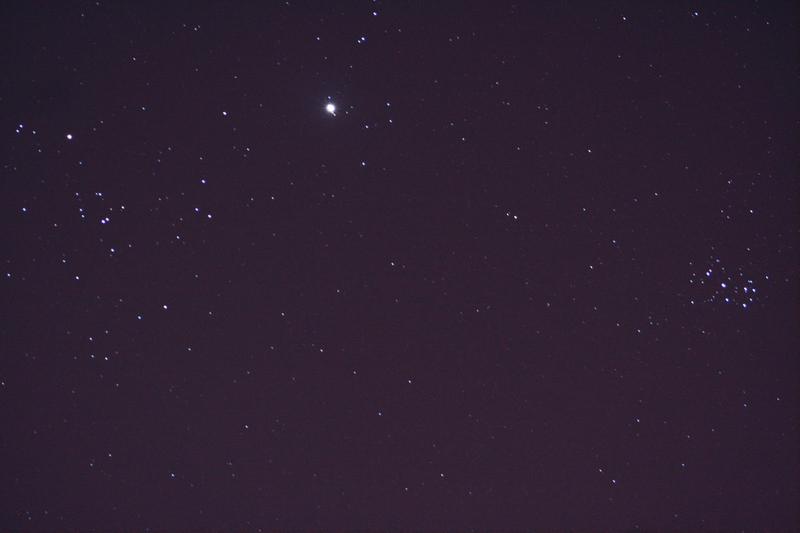 The image below was made with a simple stack of 2 exposures to reduce some of the random noise at high ISO. I also did some color adjustments in Photoshop - for some reason my high ISO exposures come out with a hazy red tint to them. I'm not sure if there is something up with the camera (it's pretty old) or the lights in the parking lot (they naturally have an orange tint to them). 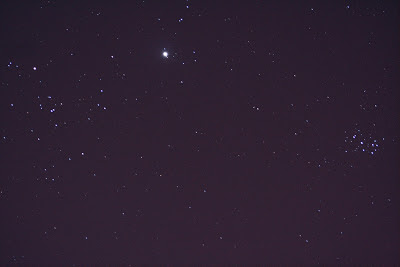 According to Wikipedia, the Hyades Cluster includes the 4 brightest stars in the "V" shaped head of Taurus. These stars, designated Gamma, Delta, Theta, and Epsilon Tauri, are all very close together (only a few light years apart). Aldebaran, however, is much closer to Earth - although it appears to line up with the other stars in the "V" shaped asterism. Same image as above, but with labels! 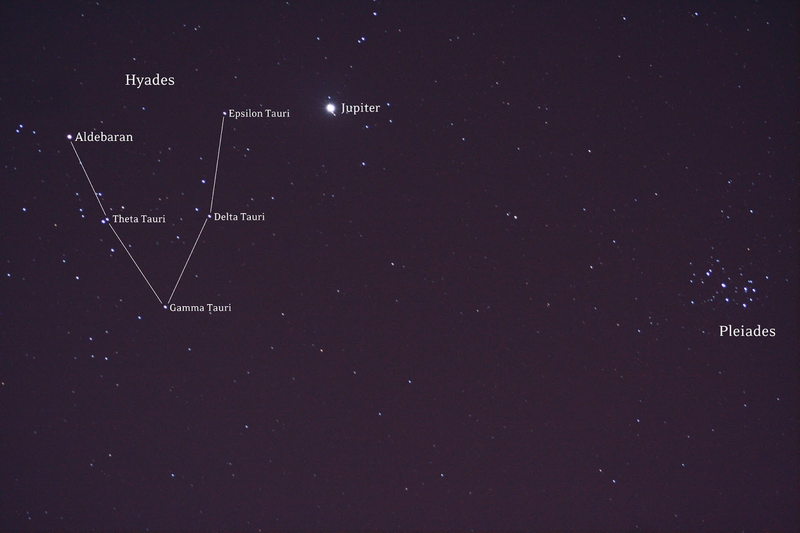 Jupiter has been passing over the Hyades since the summer (although not always visible in the Northern Hemisphere) and will hover in the area before leaving again this early Spring. Looking at the Star Walk app, it looks like Jupiter is in the middle of one of it's backwards loops in the sky (an illusion based on our perspective as we overtake Jupiter in our orbit around the Sun). Jupiter will dip between the Hyades and the Pleiades, and begin turning around by the first part of February - leaving the Hyades in its dust by April.